As we approach NaNoWriMo, I’ve been thinking a lot about how writing the story on my heart is a powerful exercise in vulnerability. Never thought about it that way? Maybe you should. And, when you do, take pride in the strength it takes to engage in this kind of vulnerability. What got me thinking about this? Well, I’ve been learning tons of things recently from an incredible woman named Brené Brown. A self-titled “researcher storyteller” and a woman as scared of vulnerability as any of the rest of us, she’s invested decades in plumbing the depths of human nature and our inclination towards shame and fear of vulnerability. 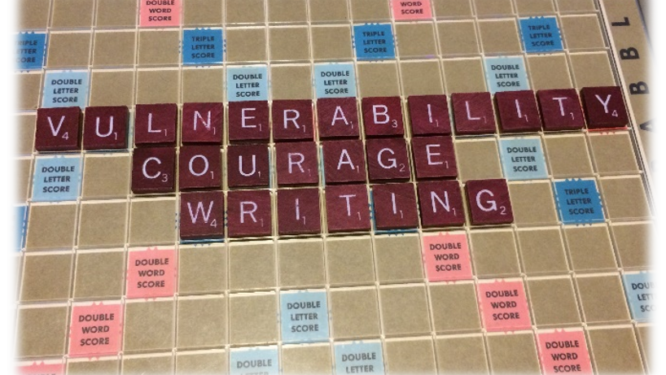 Her thoughts could be applied to any field or circumstance, but one thing she mentioned really touched at the core of what I think is the bravest thing my writer friends do—vulnerability. They write their heart, and then they offer it to trusted advisors to help them shape and fashion it, and then (scariest of all), they offer it to the world. According to Brené Brown, courage is one of the keys to vulnerability. And it takes tremendous courage to write. It requires you to believe in yourself and the tale you are weaving. If you can’t believe in yourself, you’ll never write past the first couple chapters—maybe not even the first couple pages. Some of us make it past those first pages, past the first chapters, past the landmark half-way point, and all the way to the end of a first draft. But then what? Do we have the courage to offer up our heart in words for someone to critique? Vulnerability is giving the best you have to offer and then welcoming new ideas, suggestions, and corrections. And courage means not letting your mistakes define you, but growing, improving, relishing the wisdom offered, and being confident enough in ourselves to accept all the good and let go of what isn’t helpful. What’s the last step, though? It’s one thing to offer my heart to a few trusted friends—my beta readers, my family, my editorial team. I already know they believe in me—at least I hope your team does, and if you don’t have people who believe in you, seek them out! But, the world is a harsh critic. Online reviewers can be thoughtless, mistaken, or cruel. And your story may simply not be some readers’ new favorite story. That’s when courage says, “That’s OK. It’s my story, not theirs. Their negative opinion doesn’t define me or my story. It’s just that—their opinion.” Easy stuff to write, but tough to put into practice when the reviews really come rolling in—or even worse, don’t roll in at all. In the end, though, what is truly remarkable about a writer, is that he or she is vulnerable enough to put their heart on the line and tell that story knocking on their heart. If you’re doing this, be proud of yourself. And be truly courageous—write!